The program will define sustainable concepts utilized in commercial and residential architecture and show how sustainable concepts associated with new construction also apply to existing structures. The program will explain how stainable concepts are employed in existing structures and why many believe “the greenest building is the one already standing.” Sustainable concepts to be explored are durable materials, embedded energy, conservation of natural building resources, and diverting waste from landfills. The session will explore energy usage of commercial buildings compared by decade and explain energy use in residential construction. Passive sustainable strategies will also be discussed including building orientation, passive shading, day lighting and ventilation. The session will also discuss ways to retrofit existing structures and how new sustainable technology can be added to existing structures, including historic structures, without detrimentally altering or removing significant features. The session will also examine how adaptive reuse of existing structures can achieve sustainable goals and how maintaining existing structures can promote walkable communities. 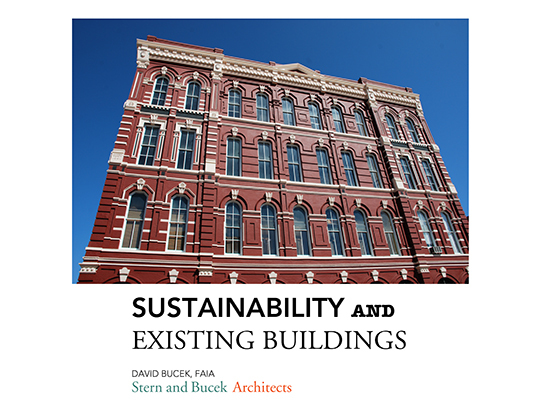 David Bucek is a principal with Stern and Bucek Architects. David specializes in new construction, adaptive reuse, renovation, and historic preservation. David’s preservation expertise includes the restoration of traditional historic buildings and the preservation of modern landmarks of the post-war heritage. David holds a B.Arch from the University of Houston and an M.Arch from Harvard University's Graduate School of Design. He has taught architectural design at the University of Houston and the University of Texas at Austin. He currently serves on the board of the Texas Architecture Foundation, Architecture Center Houston Foundation, Houston Mod, and Wharton County Courthouse Restoration/Preservation. David also serves as a commissioner on the City of Houston - Houston Archaeological and Historical Commission and on the Advisory Council at the Heritage Society at Sam Houston Park/Houston. He formerly served on the board of Preservation Texas and AIA Houston, where he served as 2016 AIA Houston President. His work has garnered awards from the National Trust for Historic Preservation, Texas Society of Architects, Texas Historical Commission, Preservation Texas and AIA Houston.